This links on this page are temporarily disabled. To put through an order, please call 973-767-3700. Thank you. 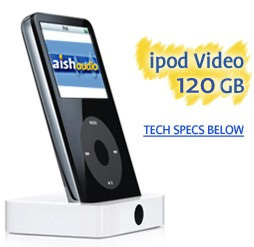 The AishAudio iPod Library is now only $429 ($50 off regular price of $479), but gets you $850 worth of pre-loaded classes on the brand new Apple Video iPod 120 GB. Your pre-load includes your choice of our "Introductory Collection" or "Advanced Learning Library." Both pre-load options contain 250 mp3 classes from today's top Jewish minds. The Introductory Collection features the popular "Crash Course in Jewish History". DUE TO A SHIFT IN APPLE'S POLICY, WE CAN NO LONGER PROCURE IPHONES, AS APPLE IS NOW REQUIRING SERVICE SIGN-UP AT TIME OF PURCHASE. YOU CAN NOW PURCHASE THE DVD LIBRARIES FROM US AND SAVE AN ADDITIONAL $50. You've seen, it you've wanted it, and now the new iPhone G3 is available in stores. To celebrate, Aishaudio is offering a 250 class library on DVD for the record breaking low price of just $129. Your 250 class MP3 DVD includes your choice of our "Introductory Collection" or "Advanced Learning Library." Both DVD options contain 250 mp3 classes from today's top Jewish minds. your choice of either the "Introductory Collection" or "Advanced Learning Library." Both pre-loads feature 200 of our highly popular mp3 titles. yours FREE with your pre-loaded library. 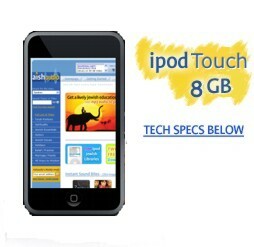 iPod 120 GB - Tech Info. 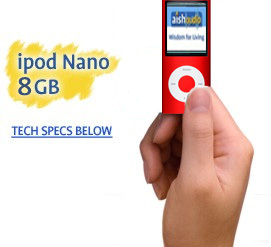 iPod Nano 8 GB - Tech Info. iPhone 8 GB - Tech Info. 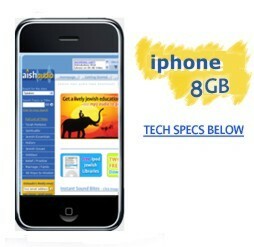 iPod touch 8 GB - Tech Info.